I got a lot of work done in the past week. 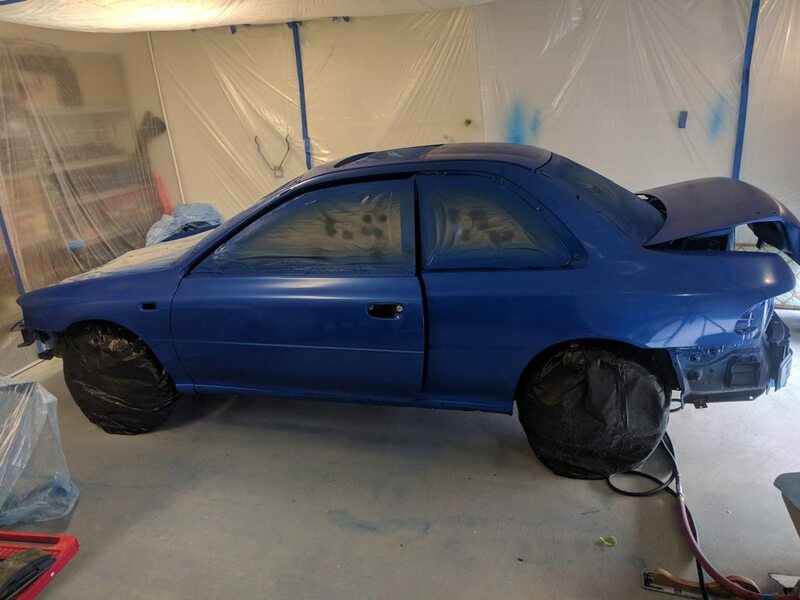 I finished all the initial sanding of the car and major pieces. I spent a lot of time block sanding panels to get them straight. Its amazing how warped they got over the years. There were several low spots and dents that I filled with body filler as well. 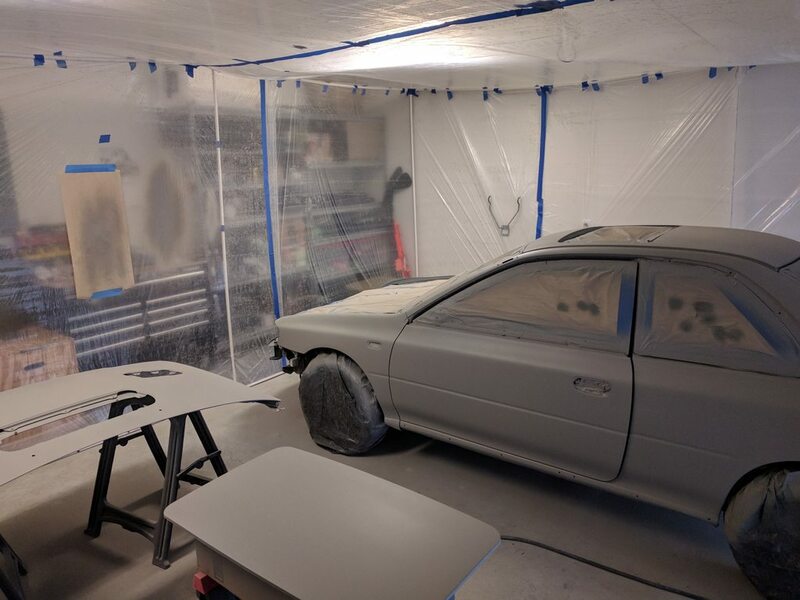 After I finished sanding, I set up a temporary spray booth in my garage and got to work putting on primer. I'll do a second blocking to further straighten out the panels and I will put down more primer if needed. 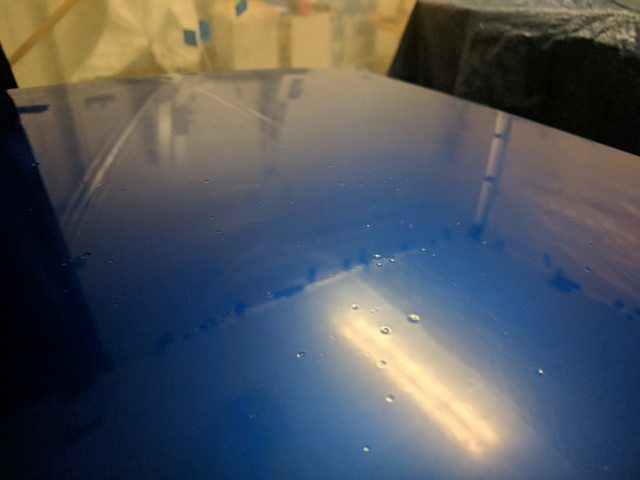 If anyone is curious, I am using a UreKem paint kit from thecoatingstore.com. 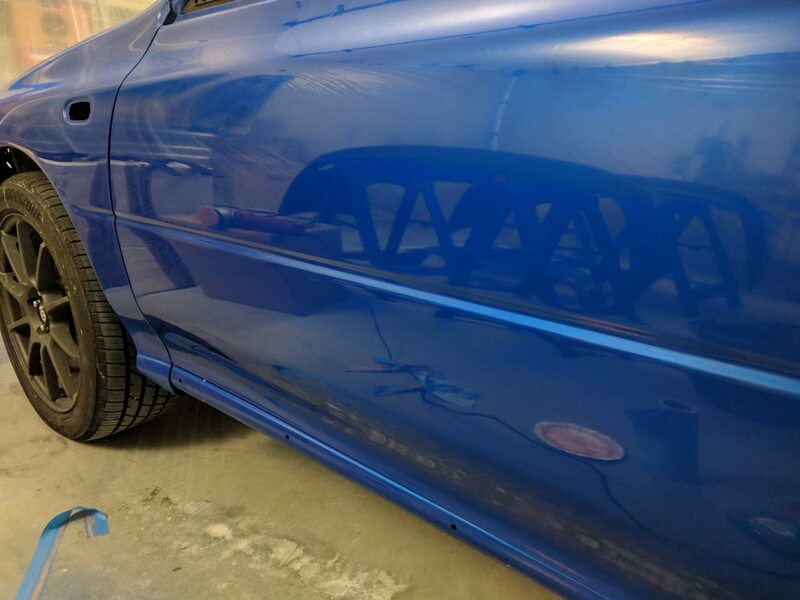 I chose this paint based off a recommendation from redfogo in this post. So far I found the primer easy to apply, though I had to reduce it a bit to get it to spray well of out my paint gun. I really like your solution to filling the holes that held the bumper guard in place. Imo the car just looks so much cleaner without them. monoposto, I found the fiberglass and bondo method really easy. Time will tell if it holds up. I looked into welding, but I don't know how to weld and I read that welding can cause the door panel to warp if not done properly. 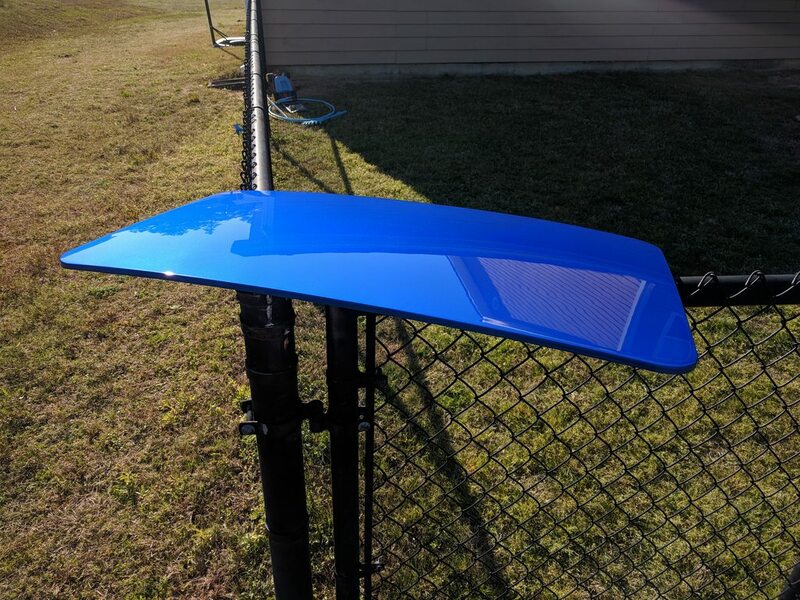 I decided to test out spraying base and clear on the sunroof panel today. I actually sprayed the base yesterday but I forgot to tack the surface off and had a lot of dust in the coat. I sanded it down and resprayed the base today. The base looked pretty good so I moved right on to clear. My attempt at clearing came out even worse. It was fisheye city, fisheyes all over the panel!. Right now I'm trying to figure out the cause. It could be moisture in the air supply, or contaminants on the surface. I have an in-line filter in between two 25 foot sections of hose, and a desiccant snake right before the gun. I thought that would be enough, but I'm going to tweak my setup to ensure the air is as dry as possible. I did not wipe off the base coat with wax and grease remover, instead opting for a tack cloth. There could have been oils left on the panel, or the tack cloth could have left residue on the panel which caused the fisheyes. Tomorrow I am going to sand the panel back down, correct the previous painting errors, and respray. Only one way to learn! I made a little more progress. 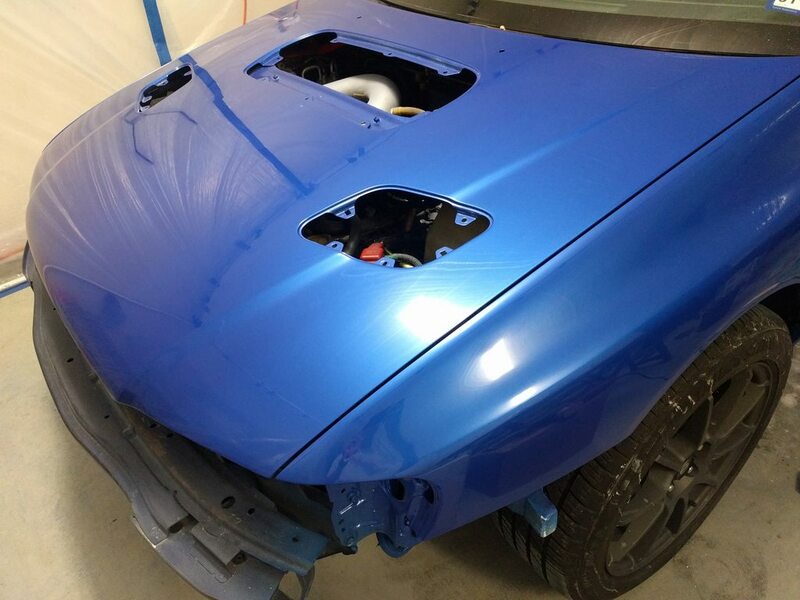 I finished up the clear coat on the body of the car. Now I'm working on a cut and buff. Once that's done I'm going to start putting all the weather stripping and moulding back on so I can move the chassis out of the garage. This will make room for all the little pieces I still need to lay out and paint. Looks good! Did you use a diy guide or a website that helped you with the painting process? I need to start researching that go see if it’s a challenge I’m ballsy enough to take on. Taiyou, I seriously underestimated the amount of time and work this would take. I did a lot of research on Google and watched a ton of painting videos on Youtube before starting this project. The pros that post videos on Youtube make the painting process look so easy, but they don't show the hours upon days worth of sanding and prep work that is needed. Those guys also have years of experience and paint in professional booths. 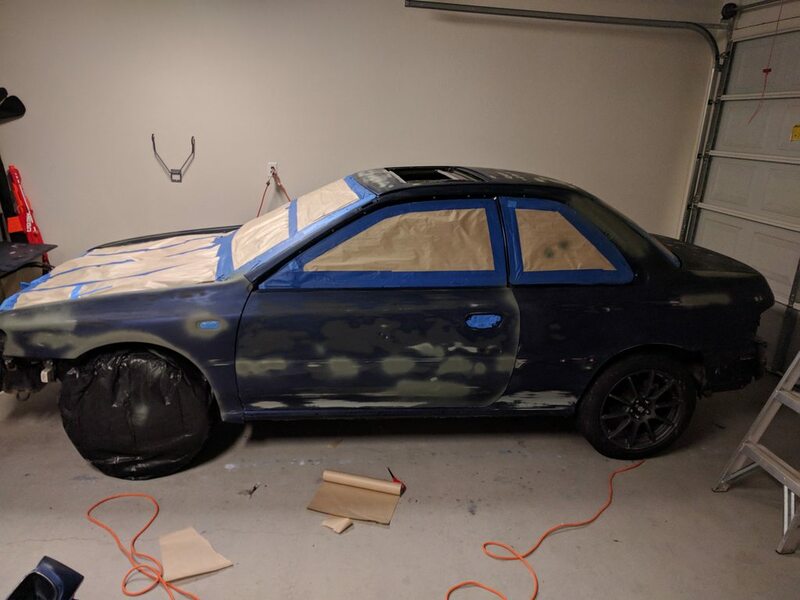 Painting in a garage is a pain, so if you can rent out a paint booth I would highly recommend doing that. I've also spent way more on factory moulding and replacing broken trim clips than I did on the actual paint. If you decide to remove all the exterior trim when painting, you will likely break several pieces. Some pieces like the trim around the tops of the door windows and the rear quarter windows are discontinued, unfortunately. Luckily I didn't break those pieces and I'll be able to refinish them before reinstalling.